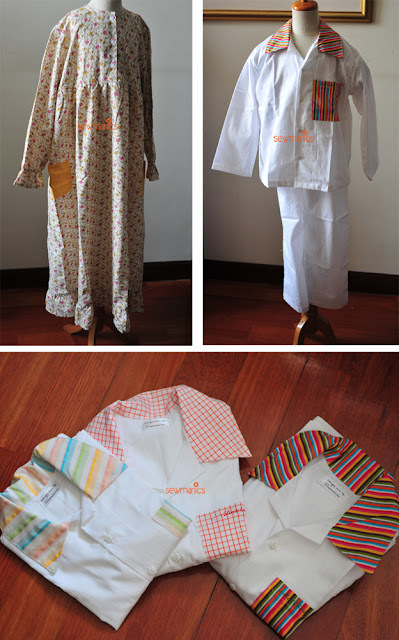 lia's crafty journey: birthday pjs are done! Fiuhhh...sewmanics is officially closed for holiday :D....As always, before the holiday, orders usually peak! We're glad we've finished some urgent and last minute orders....mostly draw string bags :) we even participate at a local bazaar by LOKKA at Grand Indonesia's West Mall 5th Floor Mini Anchor, be sure to visit, since today is the last day :). These are some PJs for our friend's little boy's birthday goody bags...I love love love how they turn out :D.
Love the crisp colorful colors against the white jammies! Perfect for a warm summer evening!